Extra virgin olive oil nourishes your body inside and out. It contains modest amounts of Vitamins E and K and plenty of beneficial fatty acids. Monounsaturated Fat: 68.7g (most of it the 18 carbon long oleic acid). But where extra virgin olive oil really shines is in its content of antioxidants. These substances are biologically active and some of them can help fight serious diseases (2, 3). Some of the main antioxidants are the anti-inflammatory oleocanthal, as well as oleuropein, a substance that protects LDL cholesterol from oxidation (4, 5). 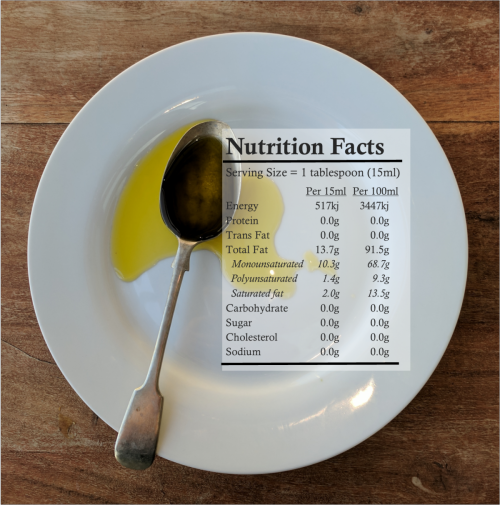 Bottom Line: Olive oil is very high in monounsaturated fats and contains a modest amount of vitamins E and K. True, certified extra virgin olive oil is loaded with antioxidants, some of which have powerful health benefits.